Flying Local Again - - PAGE 414. Flying Local Again · · PAGE 414. 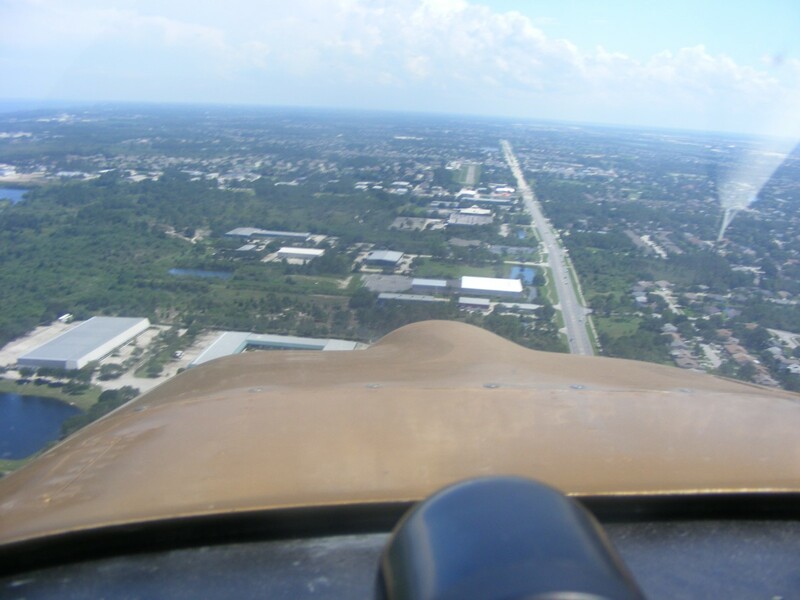 June 17, 2017: This is Saturday after the trade show in Orlando with a flight up to Massey Air Ranch for a full-stop landing then return to Rockledge. 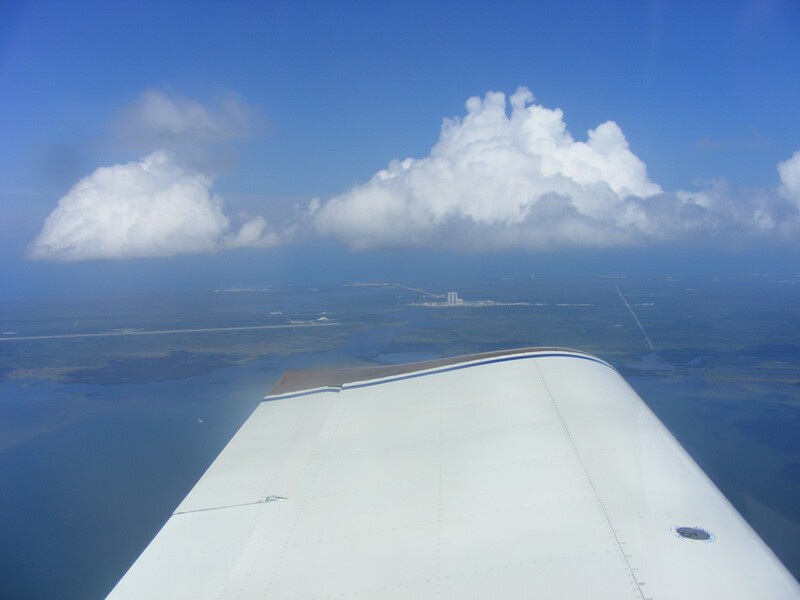 The best VFR route north is over the Indian River Lagoon. 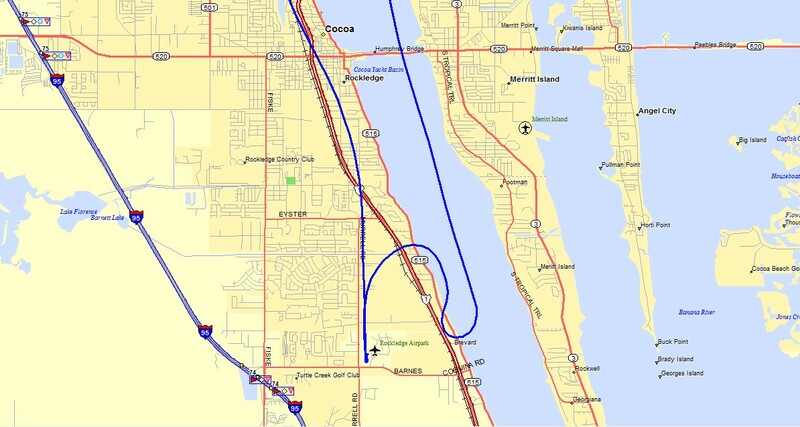 The only thing between the Titusville Airport (KTIX) and the river / lagoon is the four-lane highway US 1. 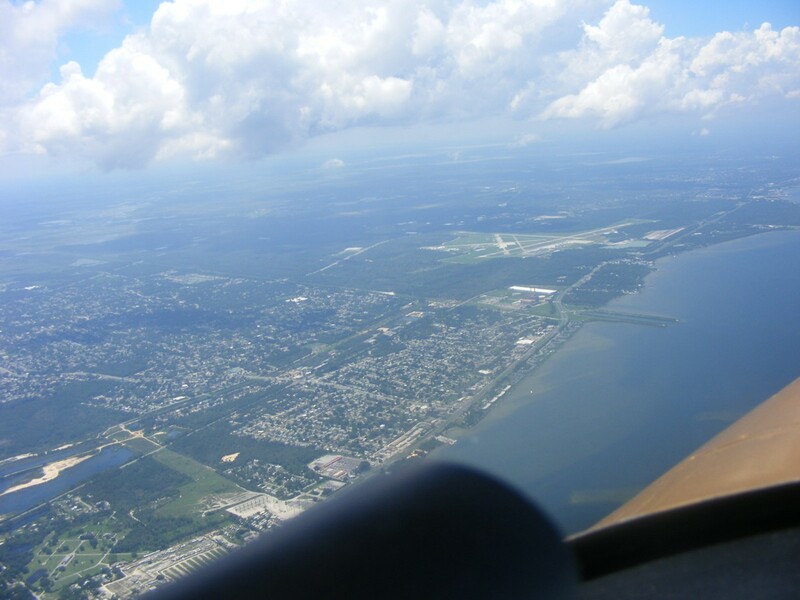 I fly over the town of Cocoa, Florida when I fly up toward Titusville and points north of here. 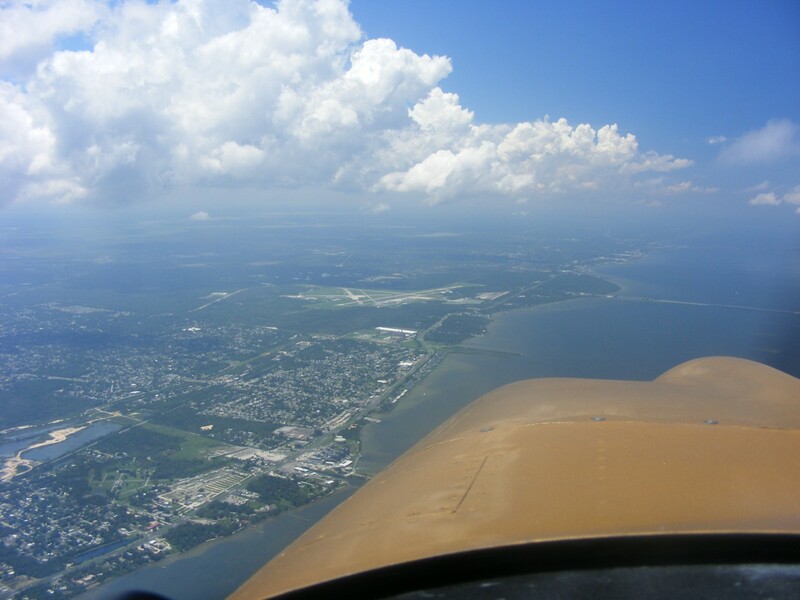 That populated housing area just south of the Titusville Airport is known as Port Saint John. 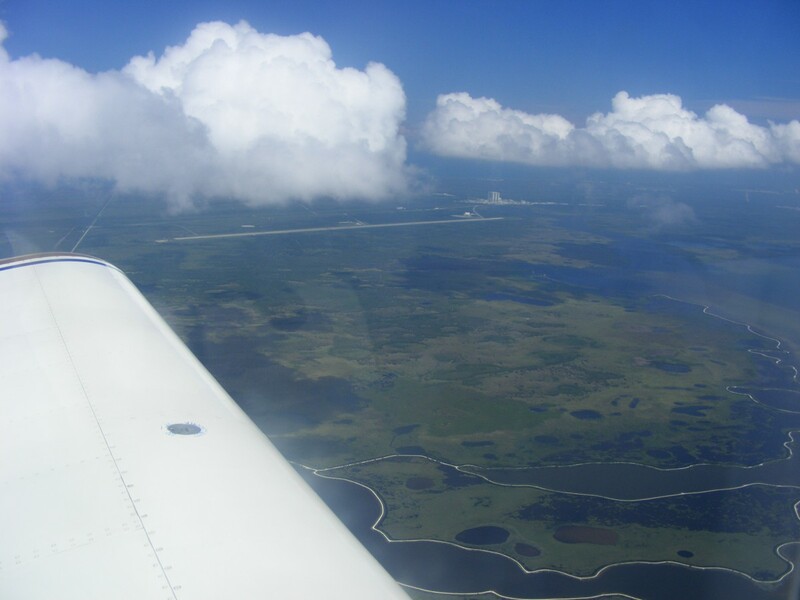 The clouds being blown from the warmer land over the lagoon dissipate, but remain intact over Merritt Island and the land at the north end of the lagoon. 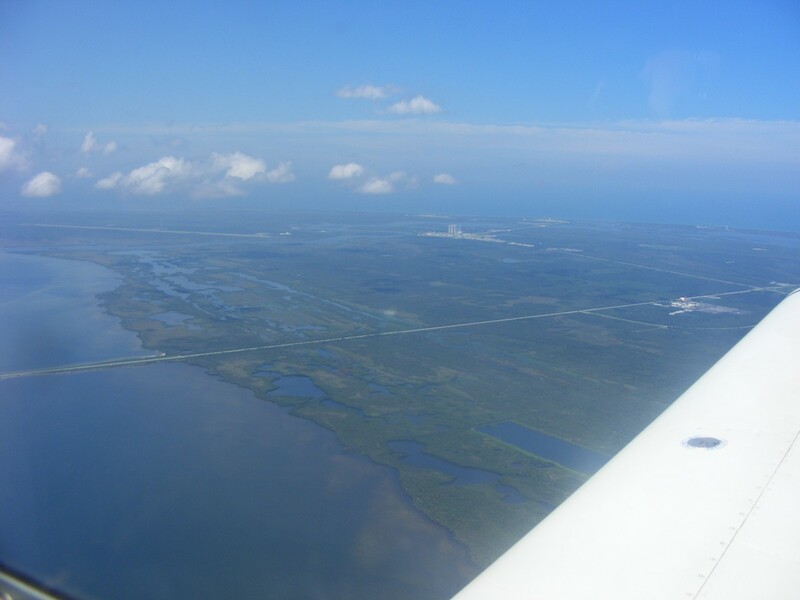 That causeway at the nose of the airplane is the route to the Kennedy Space Center Museum. This shot ahead off the right wing shows the museum near the highway. The vertical assembly building and the support buildings are near the center of the photo. 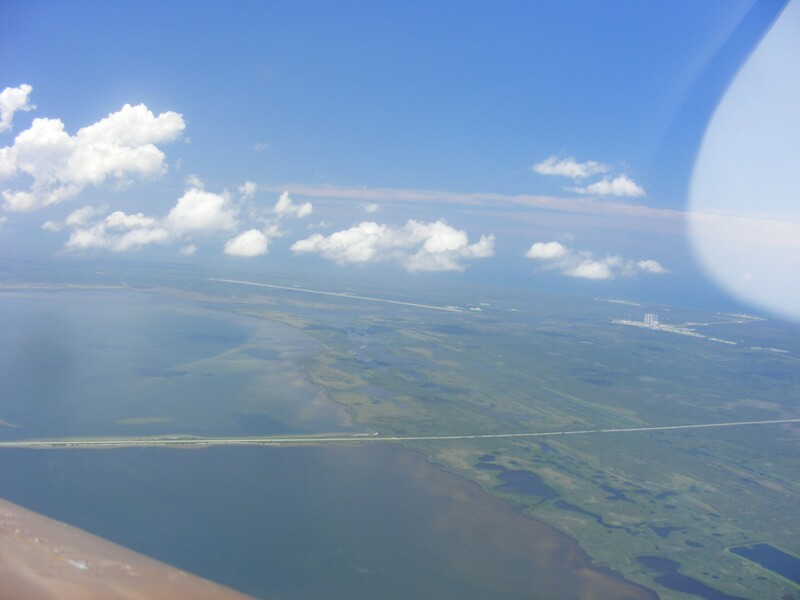 The shuttle landing strip is seen at the left side of this image. A minute or so later, the landing strip and VAB are closer and more distinct. That is the town of Edgewater ahead with all its roads running parallel to US 1 more or less. 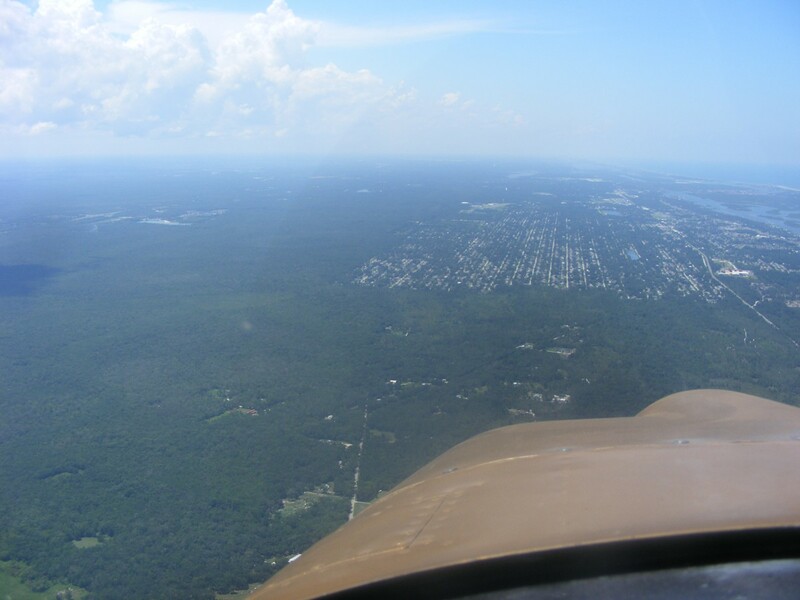 That patch of open space at the northwest corner of the town is the airport with forest land north and west of the Massey Air Ranch where I will land before heading back to Rockledge. 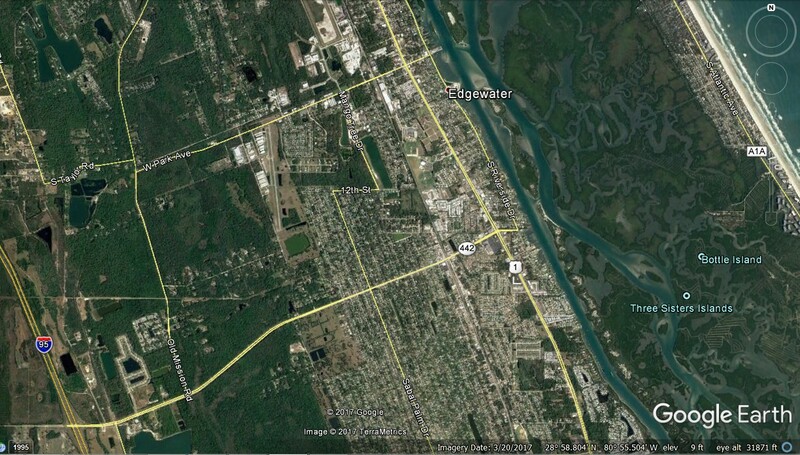 Here is the town of Edgewater seen from above using Google Earth. 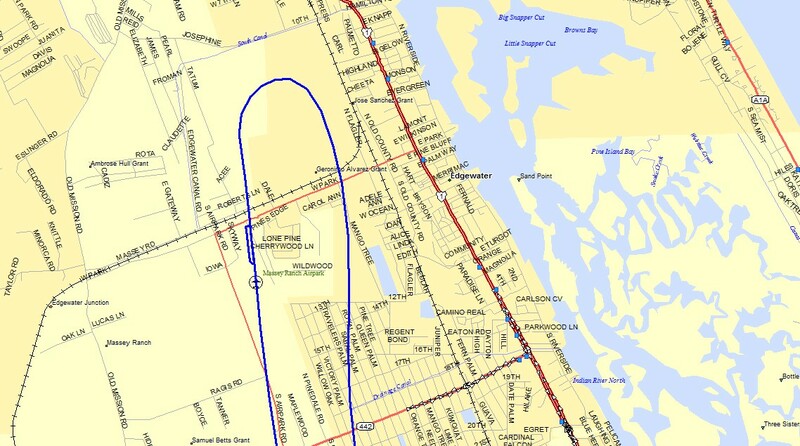 The airport is just south of West Park Avenue with the runway oriented approximately north and south, 01 and 19. Here is the GPS ground track via Street Atlas USA version 9. My full stop and taxi back to take off again is visible here at Massey Ranch Airpark. 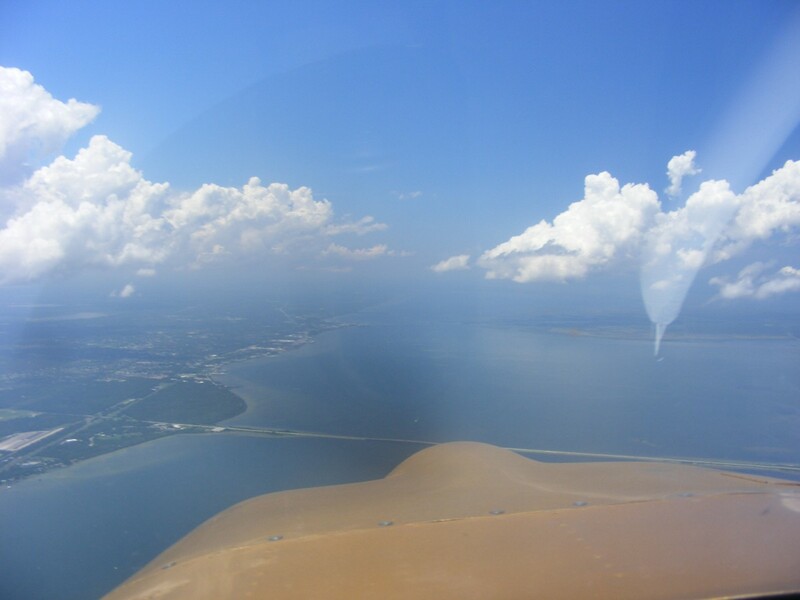 On the way back home, the local weather above the Indian River remained clear of clouds. The GPS shows my course line to the Rockledge Airport. 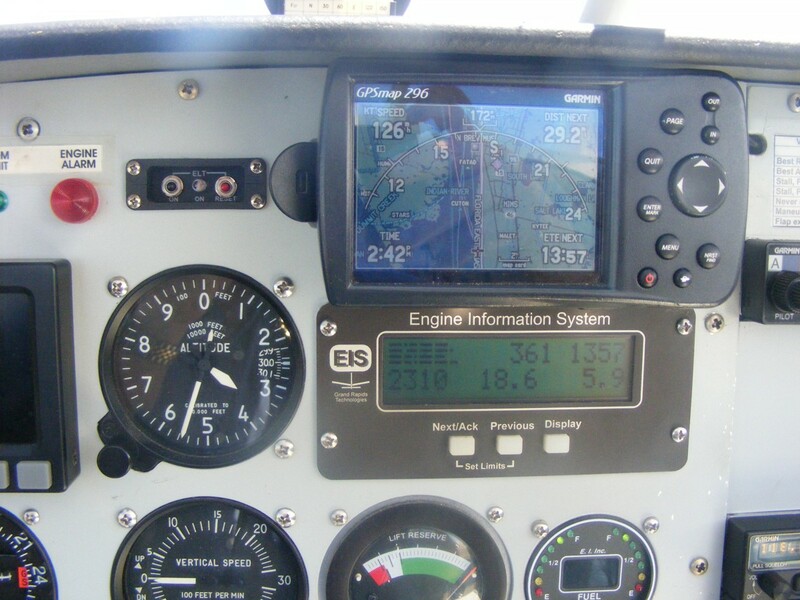 The ground speed is 126 MPH as a result of a headwind between 8 and 10 MPH that was displayed on the Dynon unit not seen in this photo. 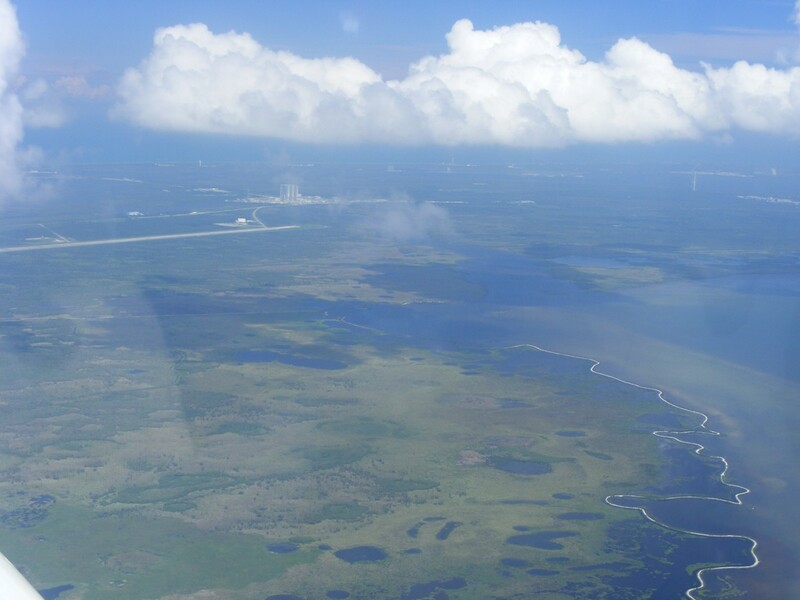 This image taken at 3,500 feet MSL looking East again shows the 15,000 feet of the shuttle landing strip and the taxiway route to the Vertical Assembly Building where the Space Shuttle would be towed to the VAB for launch preparations after each mission. This next image reveals the swampy nature of the land here that is a wildlife refuge except for the big runway that is only 10 feet above mean sea level. 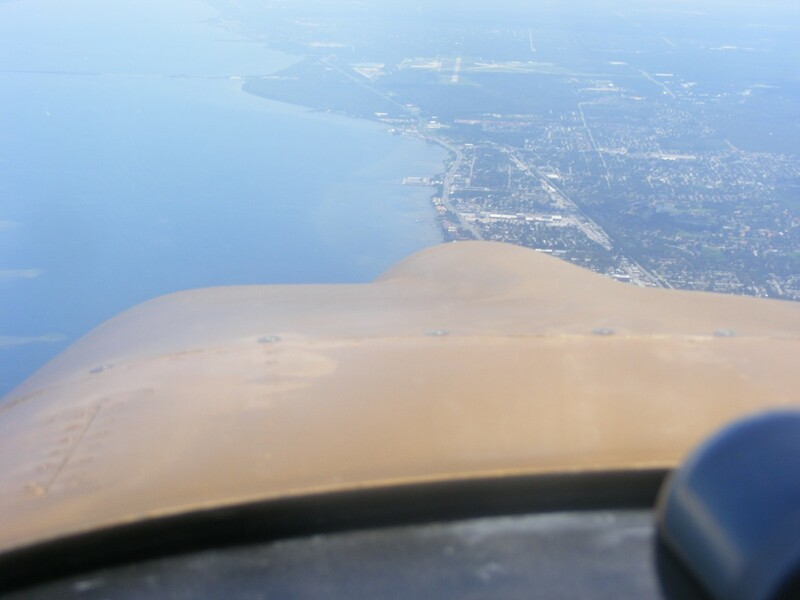 The Titusville Airport class D airspace ceiling is 1,900 MSL and I will clear that easily as I usually cross here at 2,500 to 3,000 MSL. I like to test my ILS receiver when I pass this way. Maybe some day, I will not be taking so many photos as I pass by America's gateway to space. Now comes the hard part of the day, a landing on runway 18 with a headwind that is about 30 degrees offset to the runway. This image is taken from about 1,000 MSL on approach. I am cautious coming in from the north as there can be turbulence when the wind is not straight down the runway. 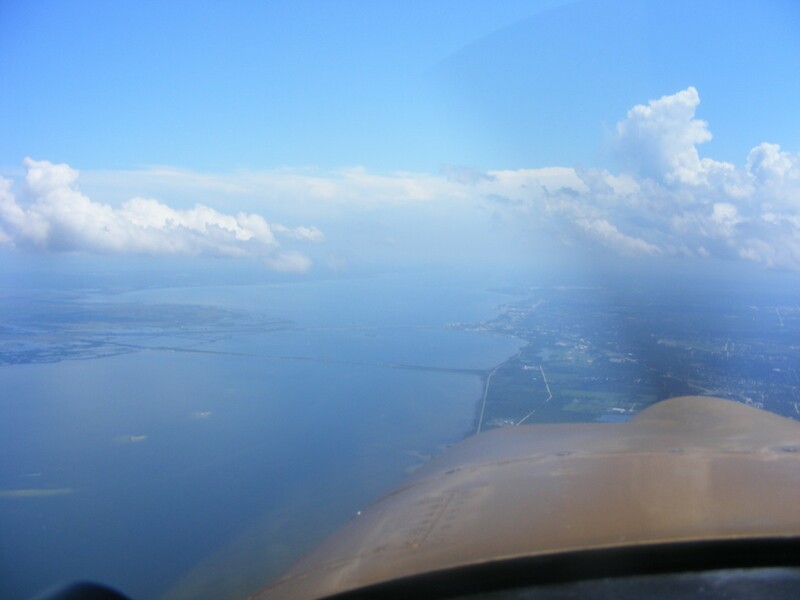 The takeoff and return to Rockledge Airport is seen here. I took off and went out over the Indian River to climb higher as I headed north up the river. Here is the GPS ground track for the complete flight today. You have seen me put the airplane away a number of times, so no photos today. Two takeoffs and landings today with 1.0 hours added to the Hobbs meter for a total time of 389.4 hours on the Enterprise. You can take this flight using Google Earth by downloading this GPS FILE and loading into Google Earth as a TOUR FILE.